On 10th of February delegates were invited to Ashridge to join the NIHR Leading to Impact Conference 2017. For the first time this Leadership event was organised by a diverse cohort of NIHR Fellowship holders as part of the NIHR Trainees Leadership Programme, including D4D collaborator and advisor Dr Joe Langley. The NIHR assigned this cohort the special theme of ‘Working with Industry’; the cohort was tasked with designing, organising and leading the one day conference around this. The event incorporated a range of sessions around ‘Policy and Practice’, ‘Public and Patient Involvement’, ‘Personal Impact’ and ‘Working with Industry’. 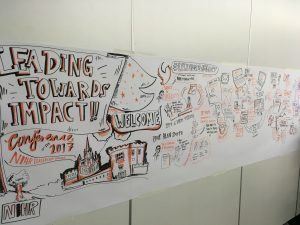 The group challenged the traditional forms of engagement at such events by incorporating round table discussion and debate, and creative ‘live reflection’ opportunities including image walls, Lego serious play, and an artist providing live illustrations representing proceedings. Dr Langley’s primary involvement was through the Industry session, though he also led the Lego Serious Play opportunity. The Industry session was facilitated by D4D’s Clinical Director, Professor Wendy Tindale, and Industry representative Professor Paul O’Brien, a long-time collaborator with D4D. They sought to identify how and why researchers should collaborate with industry, identify and address barriers to working with industry, and to consider how and when NIHR leaders could support and enable appropriate collaboration. D4D are delighted that we had the opportunity to share our experience of effective, productive collaboration for patient benefit with a wide audience with such a diverse background of NIHR leaders in this way. With thanks to Dr Langley for providing photography.